Despite 2017 being a year packed events, mainly within the realm of U.S. foreign policy, or perhaps because of it, it seemed to have gone by with unprecedented speed. 2018 has now dawned upon us; however, it is after all, a continuation of the past year, and the trends of 2017 are likely to continue. Emerging humanitarian crises across the globe, especially ones putting children at risk, show no signs of resolution. The economic crisis in Venezuela has escalated such that its children and newborns are now dying from hunger. The Venezuelan government has been reported to have denied malnourishment and starvation as a cause for increasing deaths, an action that will no doubt continue to exacerbate the situation in 2018. Yemen has made its way to a list of “The Most Dangerous Places for Children in 2017,” for the frequent selling of girls into marriages or sending boys into the military. As the blockade headed by the Saudis is unlikely to be lifted, children in Yemen will continue to suffer the consequences. One event I expect to remain a focus of 2018’s early weeks is the escalating anti-government protests in Iran. The movement is occurring across the nation, and is likely to continue as pro-government demonstrations are also being held in response. As 2017 has not been an uplifting year, it is difficult to have an optimistic outlook on 2018. My hope is that 2019 will receive much more encouraging predictions. In 2018, I expect much attention to be afforded to Trump and the repercussions of the new tax bill that was passed in the Senate in December. Along with this, the midterm elections for the House of Representatives will dominate headlines in 2018. With Doug Jones’ win in Alabama setting the stage for the rest of elections, the democratic fight to win back some power will be hugely important in the United States. Russia will also be undergoing state elections, and of course, Putin is expected to win and secure another six-year term for United Russia. The last time Putin was elected, it was accompanied by mass protests in the streets, something that may occur again – only with more violence – as the state becomes more ruthless. Another factor that might affect Putin’s popularity, in and out of government, are the findings of the Mueller investigation currently underway in America. As we head into 2018, the crisis in Yemen is also set to remain unsettled. The anti-government protests in Iran might decrease funding to the Houthi rebels, but the Saudi-led coalition is still very much active in limiting resources to the starving people of Yemen. The Middle East stands to face further destabilization as the United States moves its embassy to Jerusalem, which negates hopes for a two-state solution between Palestine and Israel. The move is highly controversial, and Israel has already moved to impose a travel ban on NGOs around the world boycotting Israel. 2018 will be a year of serious changes, both in policy and the people who create it. It is up to the people to elect lawmakers that will forge the path to a better world. Hopefully this year, voters will make wise decisions. As the recent intercontinental ballistic missile (ICBM) tests conducted by the North Korean state have demonstrated, the regime has acquired the capability to reliably deliver missiles to the United States. The regime now claims that its next objective is to match the United States in terms of ICBM firepower. Considering that the United States has thousands of ICBMs at its disposal, I expect that the likelihood of the regime actually reaching anywhere near this level of firepower is zero percent. However, I expect that the Korean People’s Army (KPA) will attempt to mass-produce and modify its ICBMs, just as it has done with the other weapons systems. Will the expanded stockpiling and testing of these ICBMs lead to a war? This is perhaps a more vital question, which constantly grasps the popular imagination. When answering this question, the recent UN Security Council Resolution 2397 comes to mind. The newest set of sanctions against North Korea further reduces oil and natural gas aid headed for North Korea by 90%. Therefore, in the long run, it aims to further sever North Korea’s connections with the global economy. As yet another resolution against North Korea passes, I cannot help but recall the situation between the United States and Japan just before World War II. At the time, the Japanese Empire imported around 50% of its oil from the United States. Thus, when the Roosevelt administration decided to halt its oil exports to Japan, oil prices there began to skyrocket. Eventually, Prime Minister Tojo’s military government was forced to make a choice: to stop expanding the empire, or to attack Pearl Harbor so that its air force could secure a gateway to the oil-rich islands of Indonesia. Unfortunately, Tojo chose the second option. The lesson that we must learn from World War II is that one country could attack another if the wrong policies are implemented. Since UN Security Council Resolution 2375 passed earlier this year, oil prices have already begun to skyrocket in North Korea, as it did in 1941 Japan. Will the UN and South Korea have provoked the regime to the point of war? Only time will tell if passing these resolutions was the correct path to take. 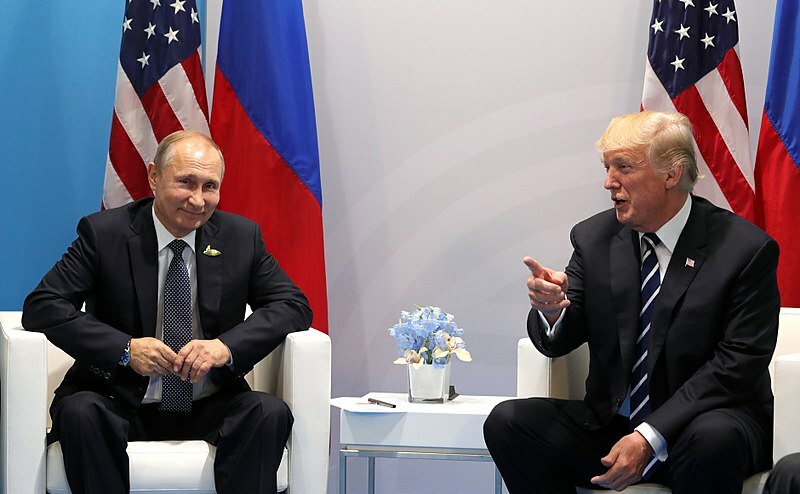 Photo: Vladimir Putin and Donald Trump meet at the 2017 G-20 Hamburg Summit (2017). Licence by CC-BY-4.0.